You will need a WordPress install to work with. You will also need Node 8.3+ and the React Native CLI installed on your machine. 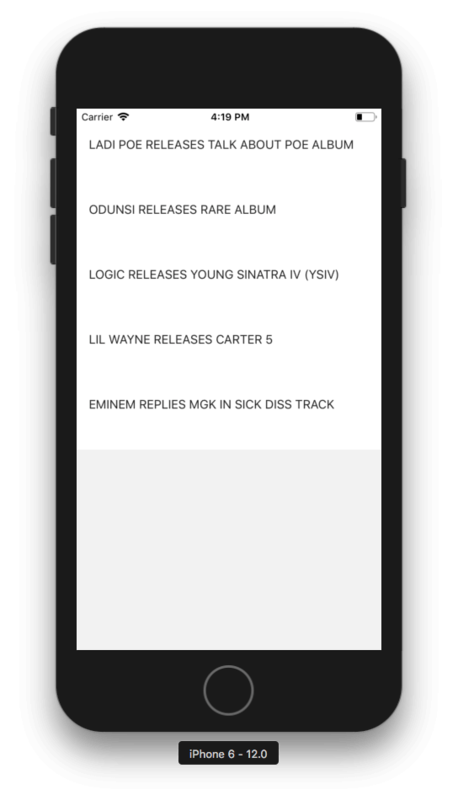 In this tutorial we are going to be building a simple mobile app using React Native called ‘Music News’ which will pull posts from a WordPress website via the WP REST API and display them to the user every time they tap to read more about the news. We’ll start with this and you can dig more and do more by reading and understanding the documentation. As mobile developers, integrating a data source is a very important aspect of building mobile apps. Having an organized data source ready for integration would make development easy and also reduce the time taken to build and develop mobile apps. WordPress as a backend can be very effective if you're building mobile applications that have a lot of consumable content such as a mobile application for a blog, e-commerce website, and so on. It can provide standard endpoints to return the data you need and also provides standard documentation for all the endpoints you'll require. WordPress is the easiest and fastest way to build your website. It's free and open source and it's based off two very popular technologies, PHP and MySQL. It is stated that over 29% of websites on the internet are WordPress powered websites. It's free and open source: that means you'll never need to pay for WordPress and if you're technical, you can also go ahead to add your own feature and functionality to it. It is easy to install: you can easily install WordPress and get started as the installation process is fast, easy to understand and not technical so therefore can be done by anyone. It's extensible: WordPress can be extended and customized by using themes to change how your website looks. There is a large plugin ecosystem to add custom functionality. Support: finding help when you run into issues while setting up or managing your WordPress site is very easy. There's the official support and also so many other WordPress blogs, companies, and communities that provide free and premium support for websites using WordPress. Cross Platform: React Native allows you to use the same codebase to compile and build for multiple platforms like Android and iOS. This also eventually saves development cost. Performance: applications built using React Native have good performance on the device since they are rendered natively. Community: the React and React Native community is solid despite it still being considered an emerging technology. There's a lot of communities and blogs that provide support for React Native issues. Fast Development: because of its ability to build cross-platform, it saves time while developing application since you don't need to rewrite any special code for another platform and code re-usability is supported. Future Plans: React Native was built by the engineering team at Facebook and has since led to the concern of copyright and privacy issues and also its future because the project can be discontinued by the team. API stands for Application Programming Interface. It can be seen as a component that allows for interaction between two programming languages, software libraries, software tools, and so on. It also specifies a set of rules that should be followed in order to interact and communicate with underlying data. An API could mean something else, depending on the context used and in this context, an API refers to a software component we will interact with to provide us with relevant raw data to be used inside our application. To get started, the first step would be to install the WordPress REST API plugin to our already existing WordPress installation. My WordPress site is on my local device so I'll be installing it there. 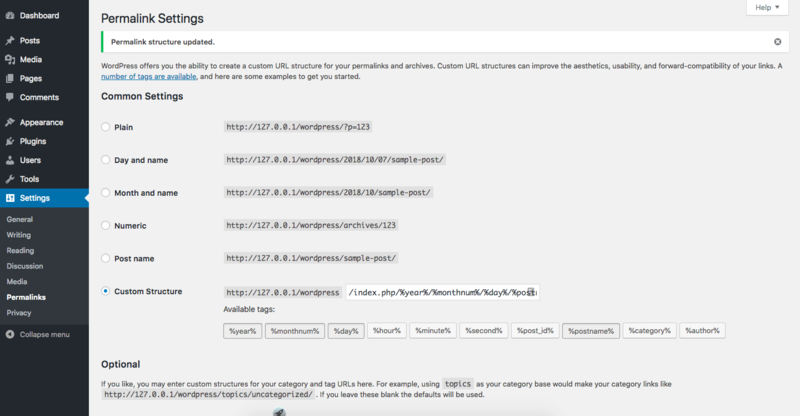 Enable pretty permalinks under Settings > Permalinks because the REST API uses custom rewrite rules. Visit http://your-domain.com/wp-json/wp/v2/posts/ to make sure everything is working fine. In my own case, I have my WordPress instance installed locally on my device and in yours, visit the host you have your WordPress installed to confirm. You should see a page containing raw data of all your posts on the websites. In order to get the data in the best visual representation, you can install Postman and use it for all API calls. We can now proceed to make more Music News posts on our WordPress normally and then visit the endpoint to see it translated into raw data that can be used in our mobile app. To get started on this, you can follow the official docs on how to set up your React Native environment on your computer. Once that is done, we need to initiate and create our application project. Once that is completed, we need to compile and build the application. Router is the main routing component. A Stack is a group of Scenes with its own navigator, so you can have multiple stacks for navigating. A Scene is the basic routing component for the main router and all Scene components require a key prop that must be unique. A key prop is used to call the screen transition and must be unique to all screens. React Native offers inbuilt UI components like the FlatList, Modal, Slider, Text, and so on. For the design of our home page, we will be using the Shoutem UI and react-native-render-html to render all the posts fetched from our WordPress backend. In the Home.js file, we import all the necessary components to build our interface. We create routing functions so we can navigate from page to page. The fetchMusicNews() is an asynchronous function that allows us to fetch data from our API configured WordPress backend and the componentWillMount() allows us to fetch the async data after the screen is rendered. The fetched data is stored in the musicNews state and will be passed to our component during rendering. In the renderRow() we define a prop that holds data fetched from our WordPress API and we pass it to the ViewNews page so we don't have to do a network fetch to get the same data on the next screen. The data fetched is rendered as a list view using the ListView component imported from our UI library and the data is also rendered accordingly. Our render() function renders the screen and we use the SafeAreaView component to handle the screens of newer device screen like the ones of the iPhone X and higher so the screen doesn't overlap. Our styles are also defined for different components and the applied to style individual components based on the defined rules. In the ViewNews.js file, we also import all the necessary components to build our interface. We create routing functions so we can navigate from page to page. The regex variable is a regular expression. We use it to remove some unwanted characters and symbols from our WordPress data. In the render() function, we go ahead to fetch the data we stored in props from our Home.js and render it using our HTML component. The HTML component is used to render the data because the news item body sent from our WordPress API is sent with an HTML format and we can perform some extra functions like setting image size and dimensions, ignore styles, etc. We can see how easy it is to use our WordPress data in our mobile application using the WP REST API Plugin. Our data can be integrated with any mobile development framework and web development framework also. 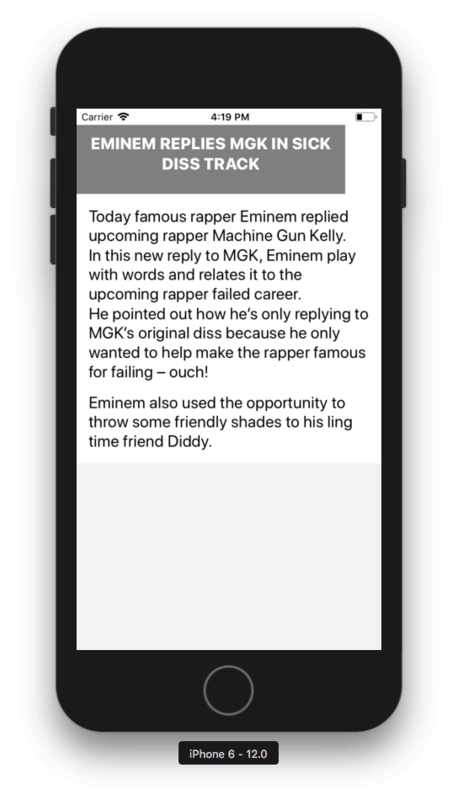 Our Music News app is simple right now, but you can go ahead to add some more styling and explore the Plugin documentation more to be able to build complex and robust applications on top of your WordPress data. The code base to this tutorial is available in a publicly hosted GitHub repository. Feel free to experiment around with it.